Aim and Objective: Because of the low abundance of 3,4-unsubstituted coumarins in plants combined with the complex purification process required, synthetic routes towards 3,4-unsubstituted coumarins are especially valuable. In the present work, we explore the possibilities of a solvent-free Green Knoevenagel condensation on various 2-hydroxybenzaldehyde derivatives and malonic acid without the use of toxic organocatalysts like pyridine and piperidine but only use ammonium bicarbonate as the catalyst. Materials and Methods: To investigate the scope of the Green Knoevenagel condensation for the synthesis of 3,4-unsubstituted coumarins, various 2-hydroxybenzaldehyde derivatives were screened as starting material in the optimized two-step procedure developed for 2-hydroxybenzaldehyde. 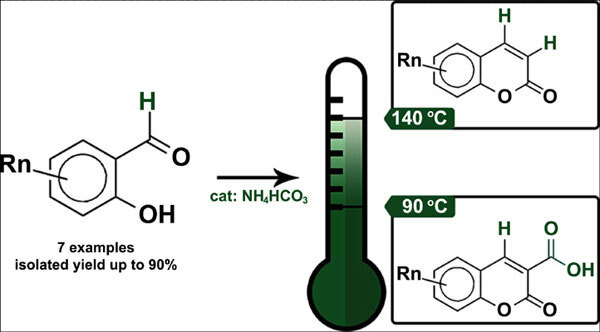 Results: This study shows that the intramolecular esterification and the decarboxylation are in competition, but show different temperature optima. In order to suppress premature decarboxylation and maximize the yield of coumarin, a two-step procedure was adopted. The reaction mixture containing ammonium bicarbonate is initially kept at 90ºC for 1 hour. After completion of the cyclization, the temperature of the reaction mixture is increased to 140ºC for 2 hours. Following this protocol, coumarin could be isolated with a yield of 95%. Conclusion: A two-step procedure for the solvent-free synthesis of several 3,4-unsubstituted coumarins was developed using ammonium bicarbonate, resulting in high yields of the desired products. Moreover, this procedure has a low E-factor and is, therefore an environmental friendly reaction in line with the principles of Green Chemistry. It was shown that by initially capping the temperature at 90ºC, premature decarboxylation can be suppressed. After full conversion to the intermediate 3-carboxycoumarin, the temperature can be increased to 140ºC finalizing the reaction. Ammonium bicarbonate was shown to catalyze both the Green Knoevenagel condensation and the decarboxylation step. Coumarin-3-carboxylic acids, catalysis, 3, 4-unsubstituted coumarins, green knoevenagel, green chemistry, ammonium bicarbonate.